The Supreme Court today has finally revoked the ban it had placed on registration of diesel vehicles with an engine displacement greater than 2,000 cc in NCR. Ever since the ban was placed in December 2015, manufacturers like Tata and Mercedes have been facing a tough time because of lack of slightly smaller engines. Mahindra, who’s product portfolio focuses mainly on diesel was quick to bring out an NCR only 1.99-litre mill for the Scorpio and XUV 500. So bye bye diesel ban. As per the new directive, Supreme Court wants either the manufacturers or dealers or customers to pay a portion of the cost of the vehicle. For now, this has been fixed at 1 per cent of the vehicle cost. Mercedes had earlier requested the Honourable Supreme Court after it filed a petition saying that it is ready to pay 1 per cent environment compensation cost. But will other manufacturers do the same do the same and bear the additional cost? Or they will pass it on to the customers? But has the diesel ban served its purpose (more on that in a later article)? The Central Government had earlier this year also announced a 2.5 percent additional cess on diesel vehicles displacing less than 1,500 cc. Engines bigger than this will have to pay 4 per cent cess. The budget also saw the introduction of 1 percent tax on cars costing more than Rs 10 lakhs. And let’s not forget the 0.5 percent Krishi Kalyan Cess on the service tax. Now that’s quite a long list diesel lovers will have to shell out. All this with the diesel ban already in place. For example, let’s take the top end Fortuner. It has a 3.0-litre mill, four-wheel drive and an automatic gearbox, and carries a sticker price of Rs 28,03,957 (ex-showroom, Delhi). As it has an engine displacement greater than 1.5-litre, 4 percent additional cess amounts to Rs 1,12,158.28. Now added to this is 1 percent luxury tax as it costs more than Rs 10 lakhs. This amounts to Rs 28,039.57. The new Environment compensation tax of 1 percent means an additional tax of Rs 28,039.57. Thus the total tax before the inclusion of local taxes and insurance costs amounts to Rs 1,68,237.42! 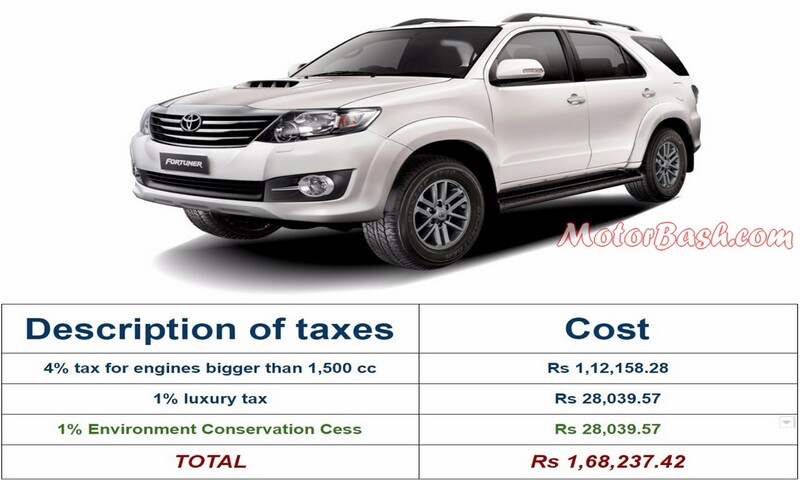 So the Fortuner which costs roughly Rs 28.03 lakhs, at this point in time requires 1.68 lakhs before local taxes are brought into the picture. But with the diesel ban finally off the grid can we have car makers bring on the fun?